Boulder celebrates bicycles with a closed-off Pearl St. -- and holds a parade honoring the Fourmile firefighters. EXPRESSING THE SENTIMENTS of a grateful community, this marcher gave her own thanks to Fourmile firefighters. The pain of the Fourmile Canyon Fire — Colorado’s worst ever in terms of home destruction — faded into a hot, dry last weekend of summer Sept 18-19. Boulder Green Streets, a celebration of bicycling and everything healthy, drew thousands to a closed-off Pearl Street spanning from 15th St. to Folsom. Record-high heat had people ducking for shade. 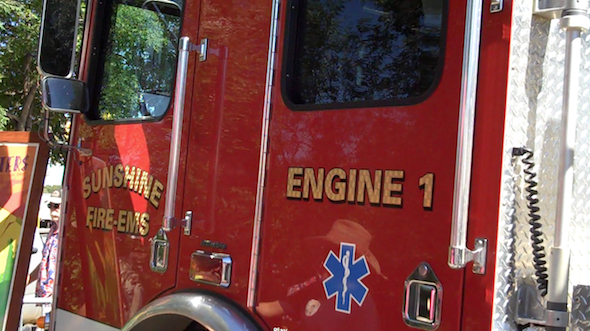 Punctuating the event was a parade expressing our gratitude to the firefighters. Some photo highlights of the weekend. SUNSHINE FIREMEN brought their fire truck down for display at the parade’s end site at Folsom and Pearl. 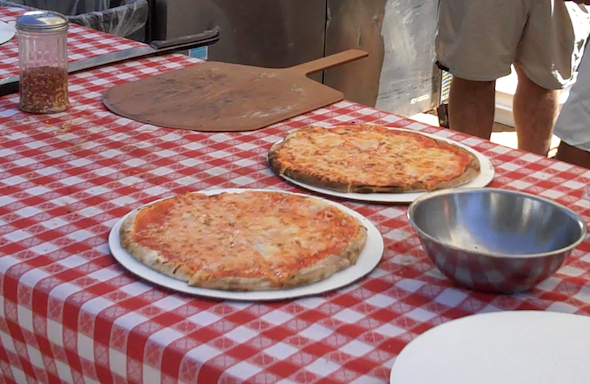 HOT PIZZA from Radda and Laudisio was served up by Tavio Laudisio and friends. It was perfect! 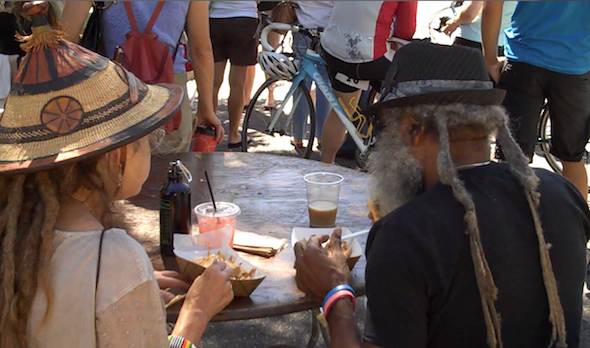 SOME PEOPLE wore their “keep Boulder weird” outfits for Boulder Green Streets fair — and also ate well. 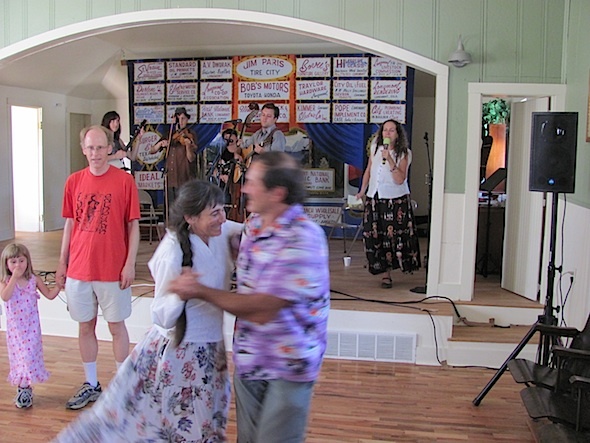 SQUARE DANCING and pie-eating were both extreme fun at public radio station KGNU‘s Sunday afternoon’s fundraiser at the Altona Grange on Nelson Rd. north of town. THE WEEKEND KICKED OFF with a well-trafficked Farmers Market Saturday morning. 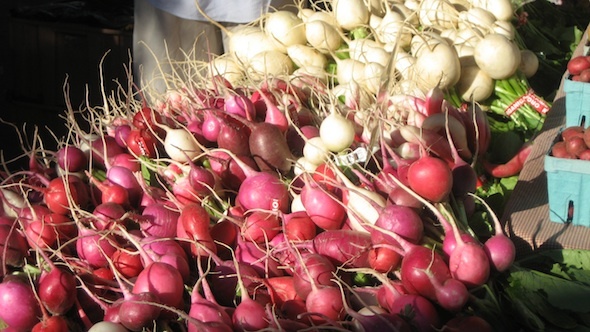 Cure Organic Farms was selling picture-perfect radishes. VIDEO BY DOUG WRAY courtesy of Free Range Longmont. Also, see Doug Wray’s Flickr photo gallery of the event (better than ours).